Pest-Stop Wire Rat Cage 14"
Humane trapping of rats or similar sized pests. Spring-loaded front entrance is triggered when the intruder takes the bait, safely trapping it inside. 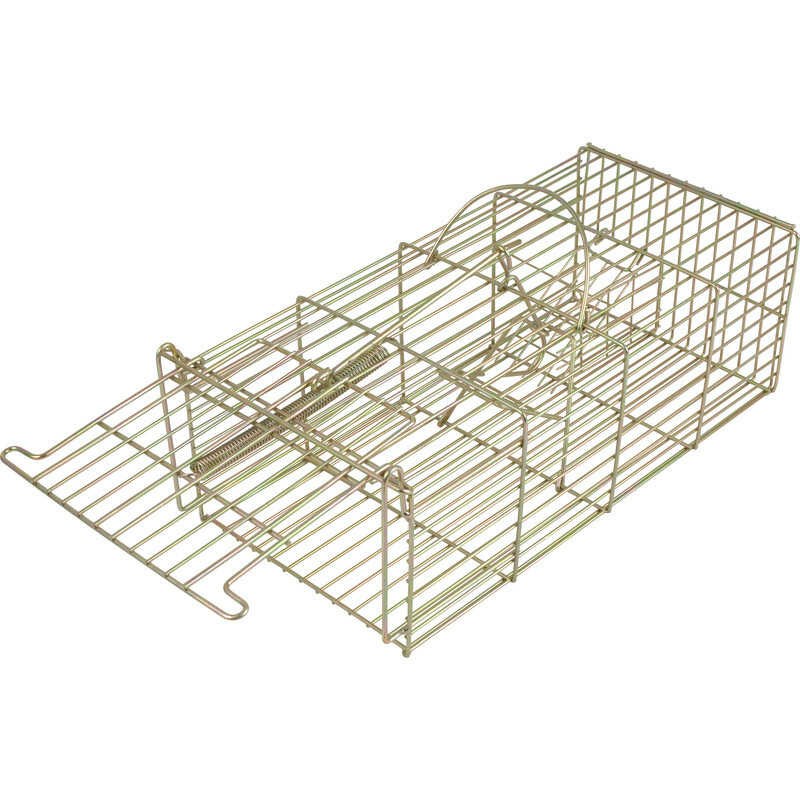 Pest-Stop Wire Rat Cage 14" is rated 4.0 out of 5 by 27. Rated 5 out of 5 by Rodent from Worked well After reading the reviews I didn't expect much, mine has worked fine have caught 3 grey squirrels the 3 times I've set the trap, didn't have to do any bending but did put wire round the back to keep that door closed. Rated 1 out of 5 by Home_fix from Poor quality item Bought this a week ago. Took it out of the box and immediately saw it was rusty and had presumably been previously used and returned. When I tested it I found that the door would not close when the trap was triggered. I had to do some bending and adjusting of the bars and lubricate the spring and hinges in order to get it to work. The overall design seems fine but the condition of the item I received was poor. Rated 1 out of 5 by kensington4 from Don’t bother I bought this trap a couple of weeks ago and all I can say is should have bought a CAT!!!! Rated 4 out of 5 by markemark from Well made Better quality than I expected. Rated 5 out of 5 by Ratcatcher1 from Rat trap The door needed a little adjustment around the hinge loop, bent the loops out a bit so door would close easy. The rear door is a bad idea and I have welded it shut. Caught 9 rats with 2 cages. 2 escaped by lifting the rear door up and getting away. Welded it shut now. Catching more than the cat now. When setting apply slight downward pressure on top of door. Rated 5 out of 5 by Pole from Pest-Stop Wire Rat Cage 14" This Pest-Stop Wire Rat Cage I have recently acquired has been very well designed for the job and well made. It is one of the best on the market and buying it from Toolstation saved a few pounds too. It is good to catch rats and grey squirrels but not many users may be aware that grey squirrels unlike rats cannot be released after getting caught in UK. Rated 4 out of 5 by GraceW from Good size cage Cages arrived next day, I was very pleased with the look of them. Had to tweak one a bit to loosen the hold on the cage door so it would release when a rat entered. Overall very pleased with them. Had them for 15 days and caught 4 rats, 1 escaped ! Also caught 4 starlings, released unharmed. Using bread soaked with pig fat for bait. Rated 4 out of 5 by Ernie9345 from Well Built The cage is well built, 4 stars because i had to readjusted the holder and the spring. The bait is still in there and i have caught no rat yet. Not sure if all the rats have died all of a sudden.